The puriri moth (Aenetus virescens) is a species of moth of the family Hepialidae. It is also commonly called the ghost moth or pepetuna. This moth is endemic to the North Island of New Zealand. It is New Zealand's largest moth, with a wingspan of up to 150 mm. It spends the first five to six years of its life as a grub in a tree trunk (common host plants are the puriri tree (Vitex lucens) and putaputawētā (Carpodetus serratus), but puriri larva also inhabit non-native species such as Eucalyptus), with the last 48 hours of its life as a moth. Footage has been taken of a puriri moth chrysalis hatching over a period of one hour and forty minutes. This species was first described in 1843 by Edward Doubleday in the book Travels in New Zealand by Ernst Dieffenbach. Doubleday named the species Hepialis uirescens. George Hudson discussed and illustrated this species under that name in his book The Butterflies and Moths of New Zealand. The moth is also commonly called the ghost moth or pepetuna. The puriri moth is easily identifiable by its large size and vivid forewing colouration. Adults exhibit sexual dimorphism. With a wingspan that averages 100mm (for males) and 150mm (for females), it is New Zealand's largest native winged insect. 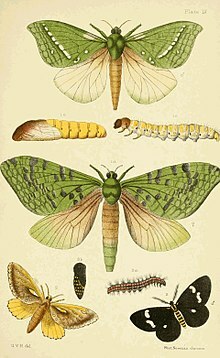 The forewings generally exhibit a range of bright greens, with patterning of brownish black in females and a white pattern in males. The hind wings are a pinkish colour. There is colour variation within the species, with some individuals exhibiting blue-green, bright yellow, brick-red or even albino wing colouration. The moths are nocturnal forest-dwellers. In the past males frequently swarmed lights in areas inhabited by people, however with forest clearing, this has become less common. Puriri moths are predated upon by birds, including kaka and moreporks (who tend to feed on the adult moths when they congregate around lights), native bats, cats and brushtail possums. The larva also are traditionally eaten by Māori, who flushed the caterpillars (known as ngutara) out of their tunnels with water. The caterpillar stage may last up to six years. The adult moths emerge mostly from September through to November. Adults live only a few days at most, generally being most active at dusk and night time when they mate and lay eggs. The adults do not have any mouthparts and cannot feed, so are sustained only by larval food reserves. The female moths oviposit around 2000 eggs during their adult lifetime. The eggs are randomly laid on the forest floor. The eggs are initially yellow-white, and darken to black, before hatching (normally after about 2 weeks). Initially the larva live under decaying wood close to the ground where they feed on bracket fungi. After about a year of living on the forest floor, the larva move into their host tree, and construct a burrow in the growing trunks and limbs of their host plants. This tunnel is often described as seven-shaped. Approximately 13mm in diameter it penetrates into the tree approximately 40-50mm and then runs perpendicularly down the tree for around 150mm at its largest. The tunnel is gradually expanded as the larva grows and moults. The tunnel is protected and camouflaged by a covering web constructed of silk and wood chips. Illustration of life stages of puriri moth (1a-1c) from "An elementary manual of New Zealand entomology; being an introduction to the study of our native insects", George Vernon Hudson (1892). The larva emerges at night to feed on callus tissue around the entrance to the burrow, where it is hidden under a camouflaged web of silk (often matching the bark in colour and texture). The larva reaches a length of approximately 100mm before it pupates. The pupal stage lasts 4 to 5 months before the pupa wriggles up the shaft of the tunnel and, protruding through the covering web, emerges by splitting through the skin of the pupa. Footage has been taken of a puriri moth chrysalis hatching over a period of one hour and forty minutes. The moth spends with the last 48 hours of its life as a moth. The moth is named after the puriri tree (Vitex lucens), a common host plant, however it also lives in a range of native and non-native forest trees. The putaputawētā (Carpodetus serratus) is another common host plant, which is named after the weta that often shelter in the old holes vacated by puriri moth larva. The larva also inhabit native beech, titoki, kanuka and maire and smaller trees such as manuka, wineberry and houhere. Introduced plants such as eucalyptus, English oak, silver birch, lemon, apple and willow are also used as hosts. ^ Doubleday, Edward (1843). "Lepidoptera". In Dieffenbach, Ernst. Travels in New Zealand with contributions to the geography, geology, botany, and natural history of that country. J. Murray. p. 284. doi:10.5962/bhl.title.25939. ^ "Hepialus virescens Doubleday, 1843". www.nzor.org.nz. Landcare Research New Zealand Ltd. Retrieved 2017-12-15. ^ Hudson, G. V. (1928). The Butterflies and Moths of New Zealand. Wellington: Ferguson & Osborn Ltd. pp. 357–359. ^ a b c d e f g h i j Miller, David; Walker, Annette K. (1984). Common insects in New Zealand (Rev. ed.). Wellington [N.Z. ]: Reed. ISBN 0589014803. OCLC 12748887. ^ a b Martin, N A (2017). "Factsheet: Puriri moth - Aenetus virescens". nzacfactsheets.landcareresearch.co.nz. Retrieved 2017-12-15. ^ a b c d e f g h i j k Grehan, John R.; Winstanley, W. J. (1980). "The puriri moth - a large, colourful insect". Forest and Bird. 13: 28–32. ^ "Puriri Moth/pepetuna" (PDF). www.doc.govt.nz. Department of Conservation New Zealand - Kapiti Area Office. Retrieved 7 June 2018. ^ a b Hoare, Robert J. B. (2014). A photographic guide to moths & butterflies of New Zealand. Ball, Olivier. Auckland: New Holland Publishers (NZ) Ltd. p. 15. ISBN 9781869663995. OCLC 891672034. ^ Blundell, Kay (9 December 2009). "'World first' as camera catches moth emerging". The Dominion Post. Retrieved 4 November 2011. Timelapse video of a puriri moth hatching from its chrysalis. 3D model of a puriri grub (pepetuna). This page was last edited on 15 June 2018, at 01:22 (UTC).